Legend, Tom Scibek is a Fluke's worst nightmare. Floating Jig Heads are the one and only real deal saltwater floating jig heads with a great quality hook and premium long bucktail hair. Floating Jig Heads are not the only items available from Tom Scibeck Fishing! Scibek offers Teasers and Shad darts as well with either a flashtail or bucktail. If you have not tried a Tom Scibek Fishing product, we highly recommend them! After the On The Water (Angler’s Guide New Jersey May 2018) Floating Jigheads write up by Don Kamienski the Floating Jig Heads by Tom Scibek have been hot sellers. A once underground item used by a select few, now Floaters are main stream! This is the one and only real deal saltwater floating jig head with a good quality hook and long bucktail hair. As detailed by Don, he fishes them on an 18″ leader off of a Tsunami 3-Way Rolling T-Swivel. I’ve found this to be very effective when fishing larger baits and especially live baits like live minnow, peanut, mullet and spot. Floaters are lights out in the bay baited with sheddard crab. My personal favorite way to fish Tom’s Floaters is to rig them on a 4-6″ dropper loop that is fished about 20″ above a bucktail jig. When fishing deeper situations it’s a hi/lo style vertical presentation. 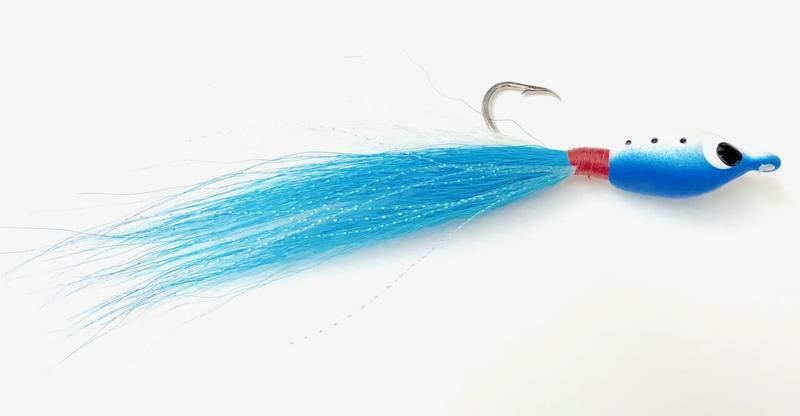 Standard issue… bucktail and teaser = lots of fluke! Where these Floaters outproduce for me is in our shallow water bay fishery. Contrary to common line “control rules” I fish this hi/lo bucktail teaser with some extra scope. This horizontal presentation shines when tap danced. The floating jig head comes alive and fluke can’t resist. Either way you choose to rig Tom’s Floaters, one thing will be consistent… they catch!